If this entry caught your eye you probably have a high effeciency front load washer. Despite having one for years I never really knew or frankly paid attention to the monthly care that is suggested by most manufacturers. Honestly, who reads those manuals? If this sounds vaguely familiar, read on. Recently, I had a service call on my washer. I was noticing a high pitch sound off and on while water was filling the drum. I never really paid much attention to what cycle or what temperature it happened on but I knew it didn't sound right. In hindsight, I wish I had taken a video of it so when the technician came he was sure what the issue was. Lesson learned! It ended up being a simple fix, a valve issue, somewhat common. The technician took the time to ask me a few questions about how I use the machine and it occurred to me I was probably not alone in my lack of attention to a piece of equipment I couldn't live without and use almost daily. So I thought I would share what I learned in the hopes that an ounce of prevention is worth a pound of cure. First question was "Show me how much laundry detergent you use in an average load". Yes, you guessed it, I was using way too much. On the inside of your detergent top are line markers 1-5. An average load should only go up to line 1. I definitely was using too much. Once the water is swishing around in the tub you should see little to no soap suds in the water. Second question...."Did you notice to code "tcl" flashing at the beginning of your loads?" Yes, in fact I had noticed that a time or two but it went away as the cycle progressed so I ignored it....what else! Sure enough, it is there for a reason, it stands for CLEAN TUB. His suggestion is once a month use a product designed for cleaning your tub. There are several brands out there, sold in grocery stores, hardware stores and of course on Amazon. Easy to use, dump the powder in the tub and run an empty hot load. In addition, you might notice a slight film on the inside of the window, grab a Lysol wipe and give it a good wiping down while you are at it. Final question was "have you ever emptied the filter or drained the hose down here?" Ok, now I really was feeling stupid! Down at the bottom left corner was a door that I had never really focused on. Open it up and there is a filter that should be removed and cleaned out each month. In addition a small tube that should be drained as well. 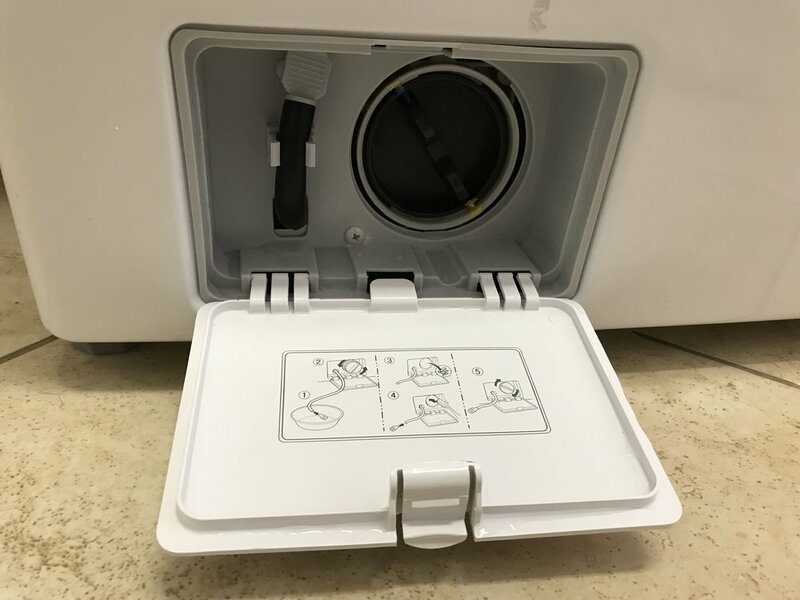 You want to slide a cookie sheet under the washer a bit to catch the water as you open the valve. Out of the tube comes slightly soapy, dirty water and in the filter you will see lint and anything that might have slipped through the holes or didn't end up in the rubber gasket. This all sounds a bit time consuming but I can assure you it takes only minutes. I have added it to my First of the Month duties along with backing up my computer on a hard drive and deep cleaning my Vitamix. I am hoping I am not alone in this deferred maintenance and that if so you find it helpful. Long live clean laundry!